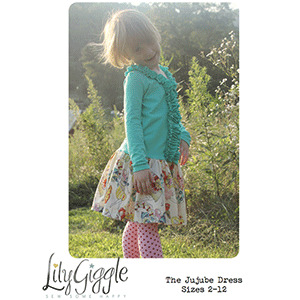 The Jujube Dress allows you to pair your favorite woven fabric with the comfort of stretch knit together on a classic drop waist dress. Topped off with a couple of beautiful rows of ruching, and an extra twirly skirt, it is sure to please your little princess. Year around appeal with options of long sleeve, 3/4, short sleeve and even sleeveless. This is a dress you will want to make for every season. This pattern can also be used to make a cute ruffly top if the skirt is not added or leave off the ruching. How’s that for versatility? 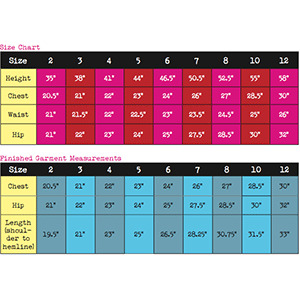 Suggested fabrics for the top are stretch knits only such as cotton lycra and cotton jersey. Use a woven fabric for the skirt such as peach skin, rayon challis, or crepe de chine.